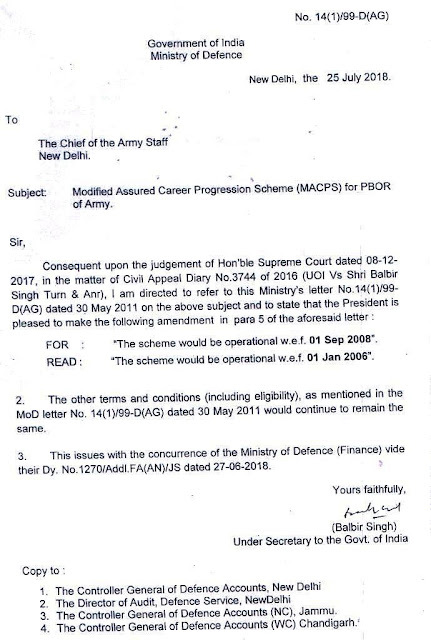 Subject: Modified Assured Career Progression Scheme (MACPS) for PBOR of Army. 2. The other terms and conditions (including eligibility), as mentioned in the MoD letter No. 14(1)/99-D(AG) dated 30 May 2011 would continue to remain the same. 3. This issues with the concurrence of the Ministry of Defence (Finance) vide their Dy. No. 1270/Addl.FA(AN)/JS dated 27-06-2018.